In my previous blog on the Ukraine exhibit, I wrote about the Trypilian culture. In this second installment, we will start by defining the Bronze Age, discuss the term “horizon” as it is used by archaeologists today and then focus on the Early Bronze Age developments in Ukraine. I will follow this up with a post next week about the Middle and Late Bronze Age periods in Ukraine. First, a word of caution to the reader: since we are dealing with Ukraine’s prehistoric past, our understanding of what occurred is based on archaeology. This means that the story of Bronze Age Ukraine is told in broad strokes. Prehistoric archaeological remains do not easily permit to identify individual cultures. We do not know what names people gave to their settlements. Instead, we make do with modern place names; we also use more abstract terms such as “horizon” rather than “culture” when we cannot identify these cultures. Moreover, our understanding of the chronological framework is not as refined as it is for later periods. However, this is what we have to work with. With that in mind, let’s visit the Bronze Age. The Bronze Age as a concept. The concept of the Bronze Age, and its position in a chronological sequence known as the Three Age System was developed by an early 19th century Danish scholar, Christian Jürgensen Thomsen. 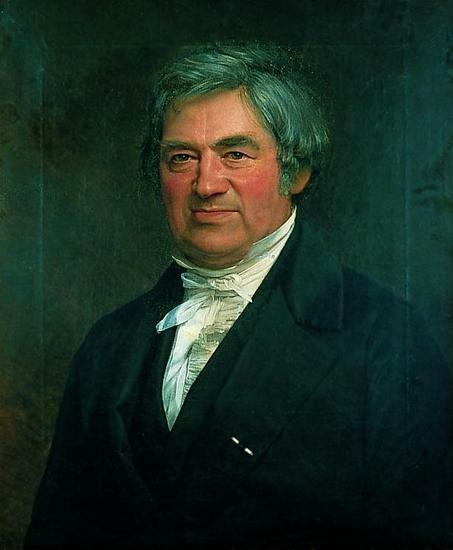 Christian Jürgensen Thomsen, who developed the Three Age System. Thomsen’s elementary division has stood the test of time and has been modified and elaborated upon over the last century and a half. We are the beneficiaries of this extensive research. In particular, we have a pretty good understanding of Bronze Age cultures that existed in Western Europe. Over the last few decades, our knowledge of East European Bronze Age cultures has improved as well. • In the Old World, full-fledged phonetic writing systems appear in Mesopotamia and Egypt. • In eastern Europe, burial mounds, or kurgans, appear, containing multiple internments. • There is evidence of signs of territory, such as long landscape divisions and evidence for status, such as in grave goods. • True weapons (both offensive and defensive) appear in the material record. These include the famous ceremonial dirks found in Western Europe, as well as shields. Occasionally archaeologists come across objects that defy identification. When such items are discovered, we are acutely reminded of the absence of written documentation that could help us. Worldwide climate change starting around 3500 BC and continuing throughout the next millennium and a half resulted in a cooler and significantly drier climate (Anthony 2007:300, 389). Steppes dried and expanded. These developments affected the Trypilians, as well as those that immediately followed them. People were forced to move their animals more frequently to keep them fed. Wagons and horseback riding facilitated a more mobile form of pastoralism, one in which one could keep moving indefinitely (Anthony 2007:300). More than a century ago, archaeologists identified a sequence of different types of burial modes, starting with the so-called Pit-graves (Yamnaya). These were followed by the Catacomb-graves (Katakombnaya) and eventually the timber-graves (Srubnaya) (Anthony 2007:306). Contemporary scholars continue to use this terminology. 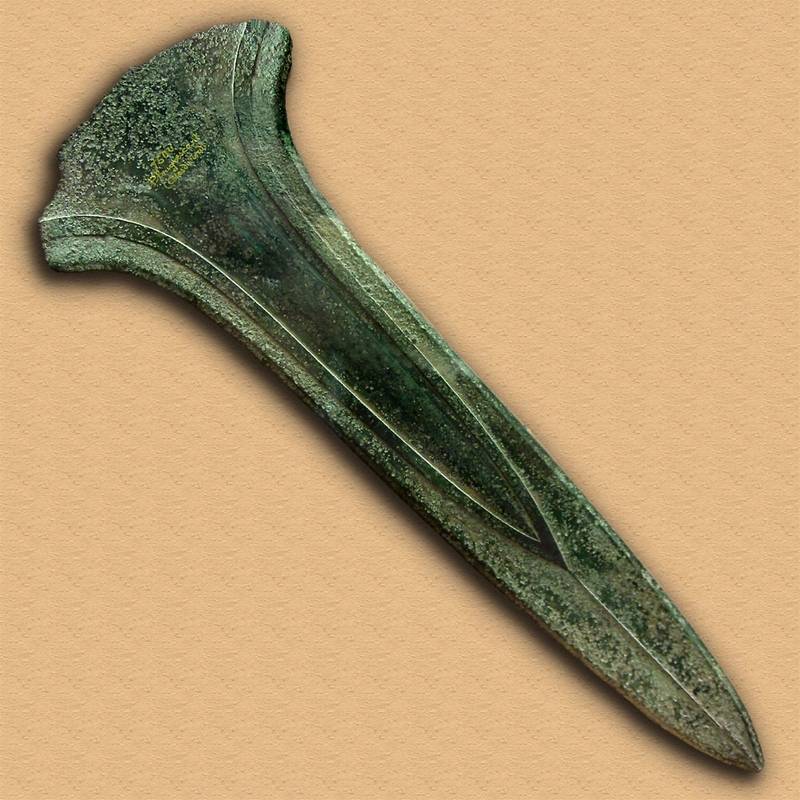 The Yamna horizon is dated to the Early Bronze Age, the Catacomb phase is seen as belonging to the Middle Bronze Age and Srubnaya and Andronovo settlements were occupied in the Late Bronze Age. 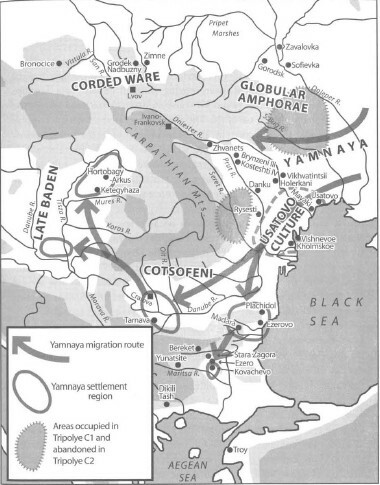 The territory in which the Yamna graves were found extends from the Terek River in the Caucasus, and the maritime areas by the Azov Sea and the Crimea, to the Volga, Upper Don and Kiev on the Dnieper River in the north (Shislina, 2001: 124). 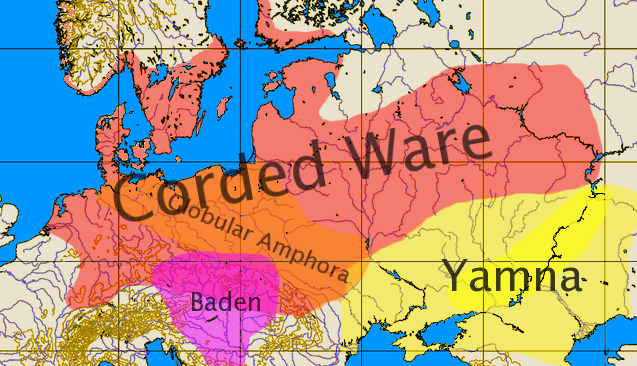 Map showing the extent of the Yamnaya horizon and other contemporaneous cultures in Europe. Notice that archaeologists use the term “horizon” rather than culture to refer to this phenomenon. The term horizon is neutral about the cultural identity of the people who made these graves. Horizon is defined as “a style or fashion in material culture that is rapidly accepted by and superimposed on local cultures across a wide area” (Anthony 2007: 307). “Rapid” is an apt description in this case. The Yamnaya people were very mobile. Wheeled vehicles probably pre-date the Yamna horizon by several centuries. However, it was during the Early Bronze Age that this technology blossoms and starts to get used more widely (Anthony 2007:312). These early wagons were cumbersome, probably pulled by oxen, and used primarily to haul around supplies and material possessions (Anthony 2007:302, 461). People themselves rode horses to stay with the herds. The earliest remains in Eastern Europe of a wheeled cart were found in the “Storozhova mohyla” kurgan near Dnepropetrovsk, Ukraine. This burial mound is associated with the Yamna horizon. Race cars they were not, but they did permit people to be much more mobile than ever before. Around 3300 BC, they are moving west across the Pontic-Caspian steppes. After a pause of about two centuries, their trek westward continues, taking them into the Danube valley and into the Carpathian basin during the early Bronze Age (Antony 2007: 305). A feature closely associated with this migration is the burial mound, or kurgan. Thousands of these have been found in the region. By 2800 – 2600 BC, their migrations bring them into the eastern foothills of the Carpathian Mountains and into territory of the people who make Corded Ware (Anthony 2007: 306, 367-368). The Yamnaya people placed a mound on top of their grave pits. The deceased was laid to rest in a supine position with the legs pulled up. Often, ochre was sprinkled on the floor of the graves, near the feet of the deceased (Antony 2007: 304). They primarily left pottery and bronze artifacts as gifts for the deceased (Shislina, 2011: 124). Occasionally polished stone objects were included as well. Burial goods are excellent indicators of growing social stratification. Some graves contained greater wealth than others. By this time, some people must have been wealthier than others in life (Anthony 2007: 303). 2001 Eurasian Steppe Nomad. In Encyclopedia of Prehistory: Europe, Vol. 4. Edited by P.N. Peregrine and M. Ember, pp. 124-138. Human Relations Area File, Inc. Previous Post Summer Camper of the Week: Get Set To Be A Vet! Next Post Prehistoric Monsters: Quetzalcoatlus!